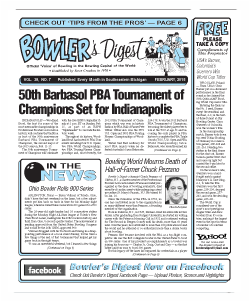 The Bowler's Digest was founded by Greater Detroit Bowling Hall-of-Famer Steve Cruchon in 1976 and is currently published monthly by Cathy and Dan Cruchon and edited by Greater Detroit Bowling Hall-of-Famer Rick Strobl. family member for Bowler's Digest's "Bowler Spotlite." E-mail .jpg photos to bowlersdigest@ymail.com.